LG Electronics’ newest smartphone has its crosshairs on the midmarket, and is combining LG hardware and Android software, to deliver a familiar, yet slightly different experience. 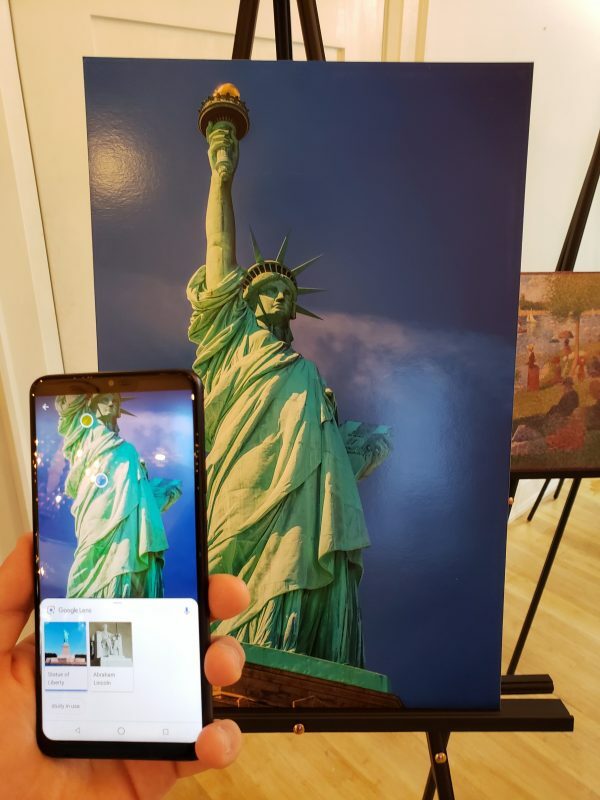 The G7 One, unveiled earlier this year at IFA Berlin and shown again during a recent briefing in Toronto, is the more affordable version of LG’s flagship LG G7 ThinQ, released in June. Slated for an Oct. 19 release date, the G7 One boasts a sleek metal and glass design and includes several of the premium features its more expensive counterpart has, such as a 6.1-inch QHD+screen, a digital-to-analog convertor, and a soon-to-be patched-in AI-CAM, first introduced in the LG V30S. But the bells and whistles don’t hide the fact that the phone is making some compromises, and according to Ash Molaei, senior brand manager for LG Canada’s Mobile Communications division, it’s why the latest smartphone from LG isn’t going to replace the ThinQ. Google Lens, Google’s new search function that uses computer vision and AI, also comes pre-loaded with the G7 One. Photo by Alex Coop. The LG G7 One features Qualcomm’s 2017 Snapdragon 835 chipset, not this year’s top of the line model, the 845. In addition, it includes a single 16-megapixel rear-facing camera instead of a dual camera setup. Despite these compromises, the premium features, combined with what LG says will be an affordable mid-market price, is sure to please Canadian consumers looking for something in the middle. The LG G7 One’s Boombox Speaker uses the internal space of the phone as a resonance chamber to deliver double the bass and audio of other smartphones. On paper this sounds neat, but in practice, the Samsung Galaxy S9 didn’t sound any worse when playing music from the device on a flat surface. LG’s first Android phone will also receive the Android 9 Pie update – the ninth major update and the 16th version of the Android operating system – before the end of the year, in addition to regular security updates with built-in Google Play Protect. The G7 One is also incredibly lightweight and durable, supposedly able to withstand 30 mins underwater. An LG spokesperson advised against putting the smartphone through that specific stress test, despite the smartphone’s strong test scores in that category. In Canada, the LG G7 One will be available at the following carriers and retailers starting Oct. 19: Rogers, Fido, Telus, Koodo Mobile, Bell, Virgin Mobile, Wireless-Wave, Tbooth wireless, The Mobile Shop, WOW! Mobile boutique, Videotron, Eastlink and SaskTel. As of this story going live, LG has not released a specific price point for the G7 One.